A wonderful set of work from one of the greatest vocal groups of the 70s – presented here in a package that features five full albums, all in little LP-styled sleeves! The first two albums might well be the blueprint for sweet soul in years to come – the legendary Stylistics and Stylistics 2 – records that managed to bridge heartbreaking soul with more righteous currents of social consciousness, at a level that's still extremely relevant all these many years later. The other records to follow are slightly less classic, but still a strong cut above most of the group's contemporaries – and are overflowing with mellow soul gems that never get old. 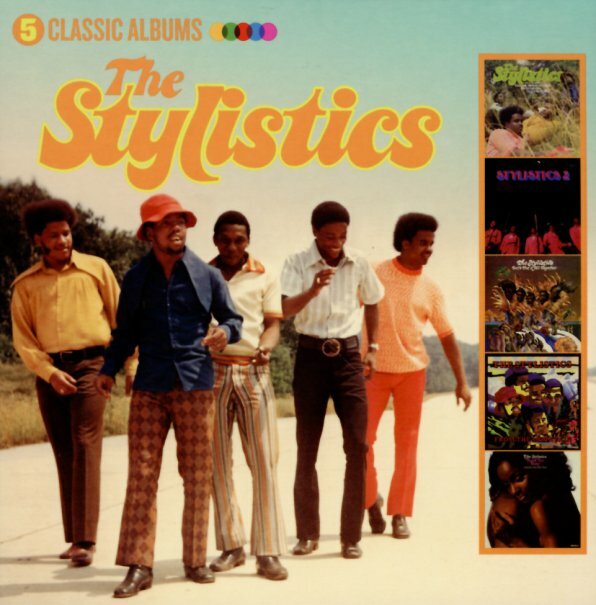 There's a special feature to this package, too – given its British nature – in that the cover of Stylistics 2 is different than the "black fist" cover in the US, with a very different image of the group used for the UK – and the album From The Mountain is actually their record Heavy – but presented here with a different title and cover for the UK. 48 tracks in all – including "Betcha By Golly Wow", "People Make The World Go Round", "Children Of The Night", "You'll Never Get To Heaven", "You're Right As Rain", "Pieces", "Love Is The Answer", "You Make Me Feel Brand New", "Star On A TV Show", "Heavy Fallin Out", "Thank You Baby", "Tears & Souvenirs", "I'm Stone In Love With You", "You Are Everything", "Stop Look Listen", "You're A Big Girl Now", "It's Too Late", "Break Up To Make Up", "Doin The Streets", and lots lots more! © 1996-2019, Dusty Groove, Inc.